Home Columns Editor's Angle Is It Better To Paddle or Pedal While Kayak Fishing? Is It Better To Paddle or Pedal While Kayak Fishing? I had just completed a challenging eight-mile paddle across an expansive flat, through a wave-strewn inlet into the open ocean and back. Even though I didn’t catch any fish, I had a thrilling tour including ripping current, breaking waves and, at the end, a stiff headwind. I glided back to the launch, jumped out of my kayak and stuck my paddle in the sand like a victory flag. A minute later, another paddler, whom I had passed earlier, crashed into shore, rolled out of his seat and wheezed, “That’s it, I’m getting a pedal boat.” As I loaded my long and low open water kayak into the back of my pick up, this guy wrestled his big, heavy standup boat onto a trailer. After two days testing and filming the most popular pedal kayaks for the Pedal Boat Olympics on page 36, I was beginning to wonder if paddle kayaks still have a place in this new world. I’m a die-hard paddler. I love the simplicity of paddling. I never worry about breaking down or running aground. Believe it or not, I paddle for fun. Sometimes I don’t even take a fishing rod! Even though a reader poll in the Spring 2018 issue of Kayak Angler showed most readers are still paddlers, with all the hoopla surrounding pedal kayaks, I’m beginning to feel like I am in the minority. Pedal boats are easier to operate, hold more gear and boast greater stability and power, which instills confidence in the operator. On the other hand, a paddle kayak is lighter and simpler with fewer moving parts. I didn’t get the pedal power appeal until I had an affair. My pedal kayak tryst occurred during a week I spent fishing with the Hobie team in Mexico Beach, Florida. I pedaled nearly every model, from the Outback to the Pro Angler. We fished inshore shallows and offshore reefs. The stability and efficiency are unrivalled. I can’t deny it, pedals are a great way to move a human-powered boat. I can get in a pedal kayak, turn the cranks and go anywhere. I’m not saying there isn’t a physical aspect to pedaling—it burns my hamstrings like a StairMaster—but pedal kayaks are designed to make efficient use of propellers and fins. The results were evident in the Pedal Boat Olympics. We put seven different pedal kayaks in head-to-head competition and they all came in pretty close at the finish. 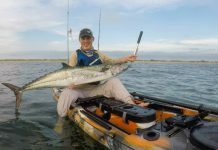 If you’re into kayak fishing just for the fishing, then a pedal kayak, or one of the new motorized models, may be the perfect choice. 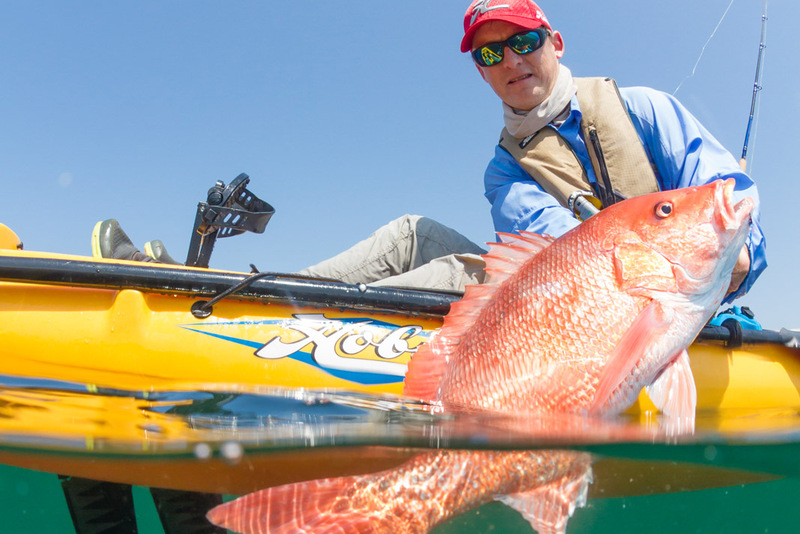 If you’re into kayak fishing for the kayaking part, then the paddle is an important part of the draw. I love my paddle, it’s light as a feather and tough like a crowbar. I love my boat, it cuts through the water silent and beautiful. I can go from truck to water in less than 10 minutes then paddle across two inches of water without missing a beat. My boat is designed to launch and recover through the surf without panic. Then spin on a dime and instantly throw on the brakes. As for speed, maybe a pedal boat will win in a long-distance event, but a paddle kayak can often shave distance to gain time. On recent trip, two pedal guys and I left the launch at almost the same time. They had to pedal around shallow shoals I could cut across. I was able to skirt the shoreline and escape a nasty headwind. They had to stay to the center of the channel and take it in the nose. The advantage allowed me to reach the spot first. Back to the guy wheezing at the boat ramp; he doesn’t care about the thrill of paddling. He bought a big, wide paddle kayak because he was concerned about stability. The boat served him fine in the farm pond back home, but on the open water it proved a sea beast. He doesn’t need a pedal kayak, he just needs the right paddle boat for the conditions. Long distance paddler, Kayak Kevin Whitley insists paddle and pedal fishing are two different sports. Paddle anglers, he’s found, are more interested in simplicity and experience of paddling. Whitley points out, “All you need is a boat, paddle and PFD and you’re out the door.” Paddlers aren’t concerned about breaking rudders or stripping gears. Whitley’s biggest horror, “Some people think paddle kayaks are old school,” he shakes his head. “They say pedal boats are for serious anglers.” Sure, pedal kayaks are popular with the tournament crowd; the range and hands-free fishing are too great an advantage for competitive anglers to deny. 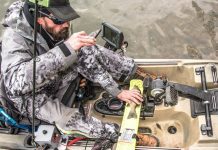 But many serious anglers who want to avoid mechanical breakdowns, added weight, increased draft and other limits to pedal units choose to paddle. Pedals, paddles, motors, hybrids, SUPs, river, ocean, lake, pond, standup, sit-down, the choice comes down to who you are and how you will use the boat. I’m lucky to have a perfect kayak for the fishing I do. There’s a perfect kayak for the guy wheezing at the boat ramp, too. Somewhere, out there, is a perfect kayak for every angler. Follow us @kayakanglermag for more fish finders and secret spots. Next articleWhy Did 3 Anglers Kayak Florida’s Longest River? 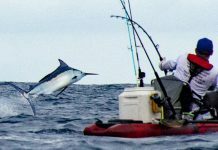 Kayak Angler is the world's leading kayak fishing magazine and the number one source for fishing kayak reviews, rigging and tactics for saltwater and freshwater species, plus industry news and fishing reports on what's biting near you.